As most of you know, I, Shannon MacMaster, live in the small town of Seaside Park, located on the coast of New Jersey. The piece of land is basically a 400 meter wide sandbar that acts as a wind tunnel and sits between the Barnegat Bay and the Atlantic ocean. I have been a dedicated member of the Running2Win community since December 2016, logging my workouts and running adventures there for over 2 years now. Tuesday, May 22nd, 2018 was the day I began my summer training for Cross Country season. But let me tell you about an experience I had with one of these challenges. I somehow joined a challenge, presented by Lululemon, in early January, that required you to run 80km by January 15th. Once I ran the 49.7097 miles, I was surprised to receive an email containing a 25% off coupon. While you may think this is a lavish reward, let me shed some light on the fact that this is actually a slap in the face. A pair of full length, solid color, Lululemon running tights, regular price, cost $98.00. 25% off means that these tights will cost $73.50. I’ll have you know that I recently purchased a pair of full length, lightning bolt patterned, Old Navy running tights, for $8.50. That’s right folks. $8.50. I’m sure you now understand why I was severely offended by Strava’s “generosity”. And while Strava is much easier to use and navigate, it lacks the intimate team aspect that Running2Win provides. 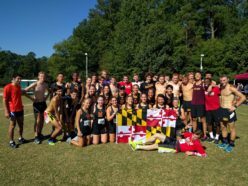 We, UMD Club Running, have allowed r2w to evolve into a place where we can support each other through the the ups and the downs of our training. We have built a community on that terribly built website in which our infatuation with running is not only acceptable, but encouraged and we can vulnerably share our successes and failures with our teammates. A couple weeks ago, when I did a fartlek in Hyattsville, I accidentally peed in my pants TWO times. Did I feel comfortable writing about this experience on Strava? No. Did I feel comfortable writing about this experience on Running2Win? Absolutely. No one was from our team was going to judge me about that one. In conclusion, Running2Win is far superior to Strava, and if you haven’t signed up yet, you should! Strava can’t come back from this. The debate is over.